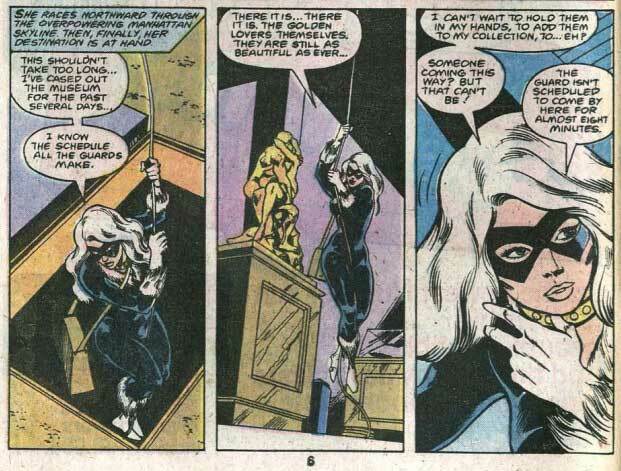 We meet the Black Cat as she attempts to break into police headquarters. She steals some files to find suitable candidates to be her minions. First up, is a strong guy type named Bruno. Next up, is a demolitions expert named Boris Korpse. 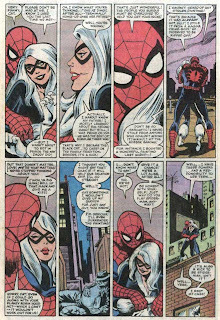 After several pages of Peter Parker stuff, we see Spider-Man, as he gets his first glimpse of Black Cat, and his first thought is about dating her. Spider-Man falls prey to her seeming bad luck powers when a stack of guns falls down on him. She runs out, but doesn't run far, sticking around long enough to seduce him, leading to their first kiss. She scampers off before the police arrive, meeting up with her gang. Her plan is to break into prison and free Walter Hardy. 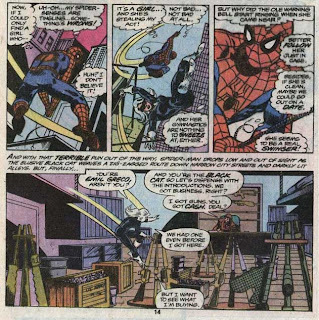 Peter Parker catches a news story about the missing files from the police station that the Black Cat had stolen way back on the second page of the story. The files were on Bruno, Boris, Emil Greco, and a fourth guy named Walter Hardy. 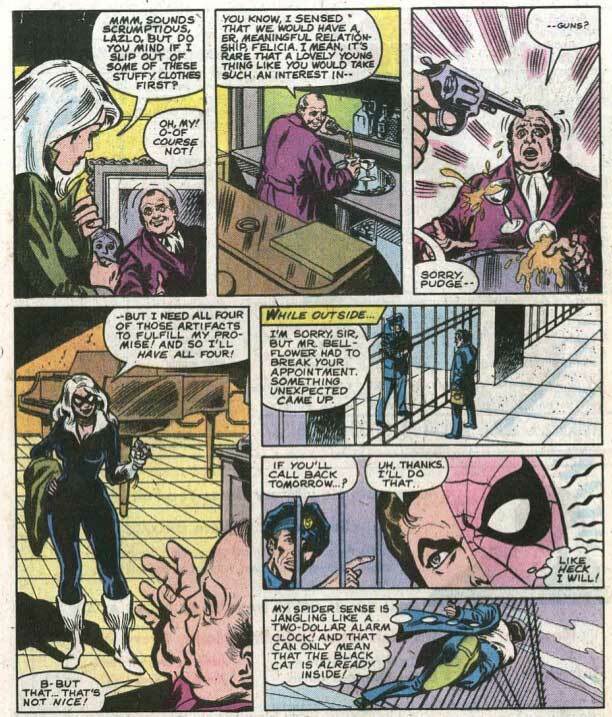 Putting three plus one together in his mind, Spider-Man tracks Walter Hardy down to his prison cell, just in time to see Black Cat and her assistants working to break in. 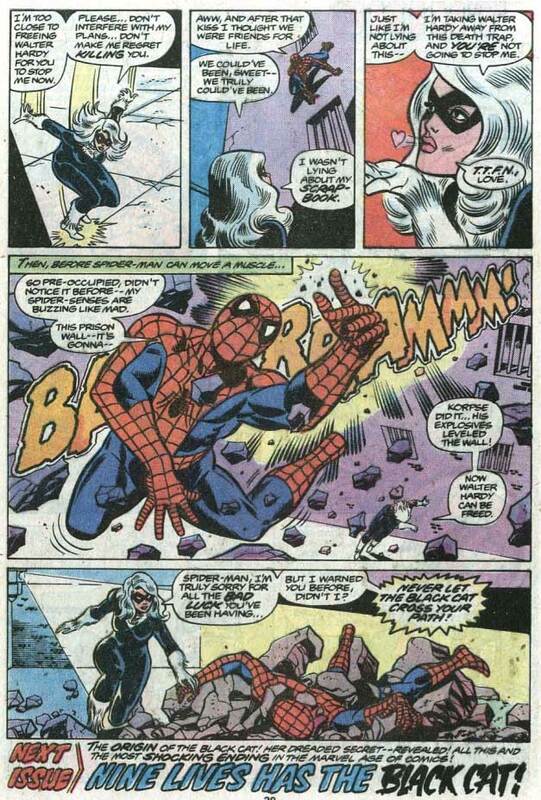 Korpse's explosive charge goes off, hitting Spider-Man with the debris. 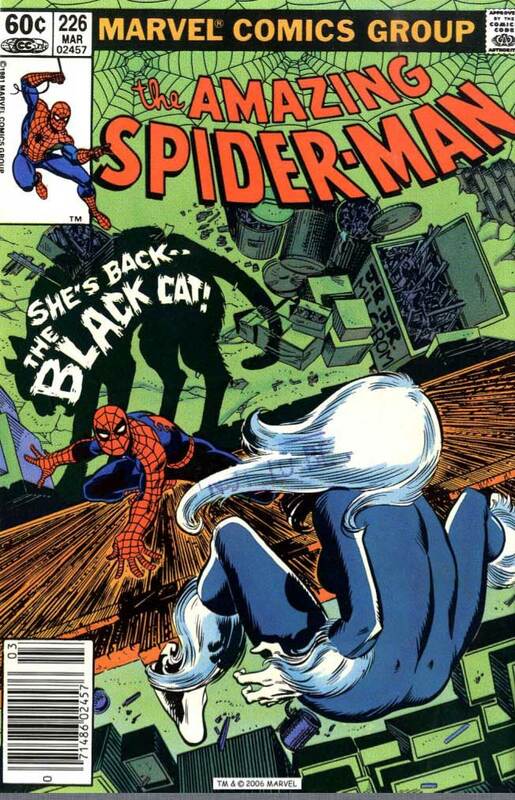 My brain thoughts: A solid first appearance that sets up Black Cat's flirtations with Spider-Man. But is she doing it because she really likes him, or just to get out of getting caught? 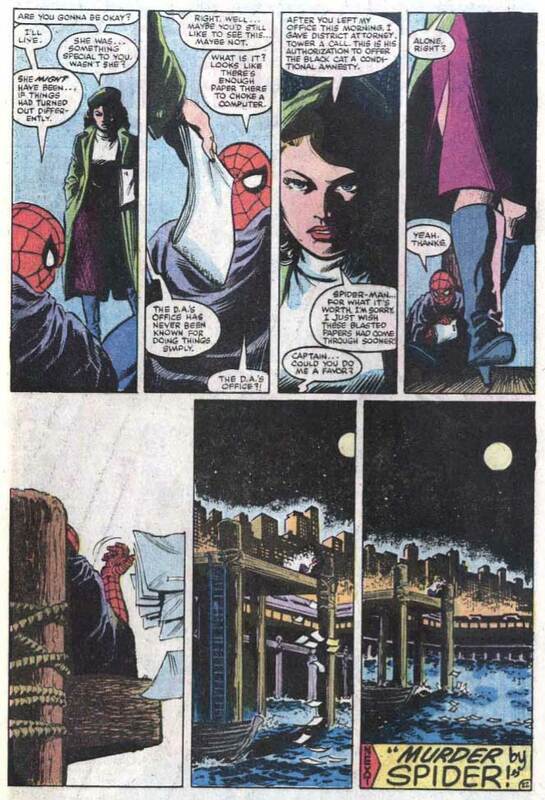 I find it funny that Peter is so mesmerized by this woman and a kiss from her, that he just stands there dumbstruck while she escapes. 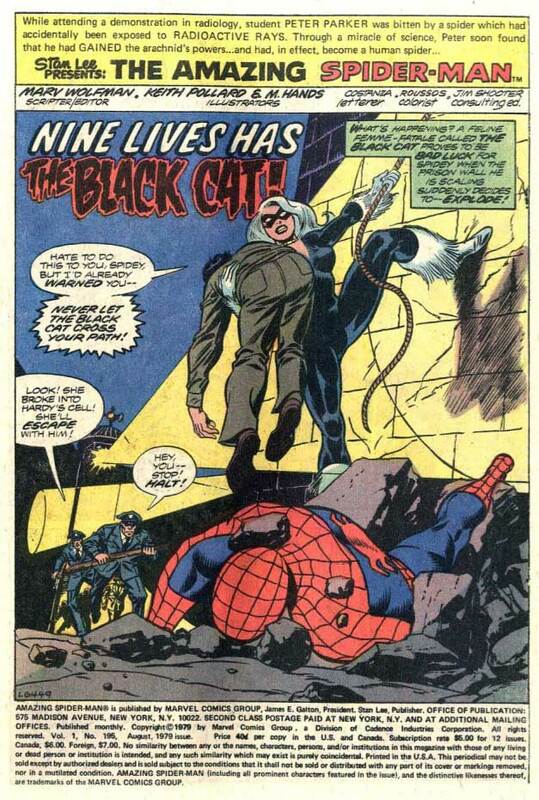 Black Cat escapes with Walter Hardy, leaving Spider-Man behind to crawl out of the rubble with a busted arm. 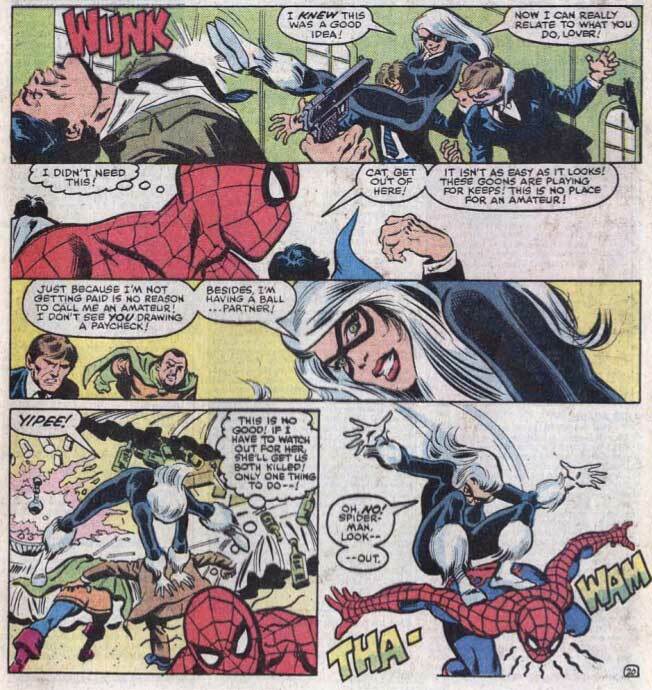 Cat eventually gets Walter back to his former home, where she reveals herself as Felicia Hardy, his daughter. Turns out she didn't want her father to die in prison, but at home with the people that love him. 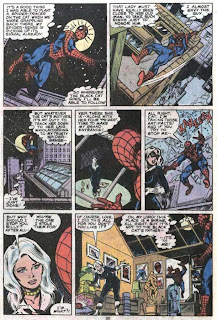 Spider-Man arrives to bust up the festivities, having found out that Walter had a daughter and tracked her to that address. He chases and fights her across the city, playing pretty hard as he does. They find themselves on the roof of a house overlooking a body of water (where is this in New York? 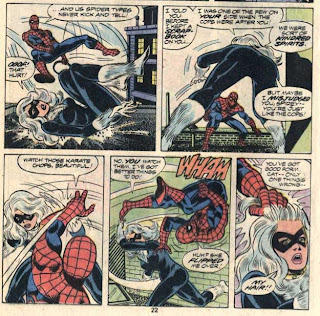 ), and Black Cat goes tumbling into the drink. 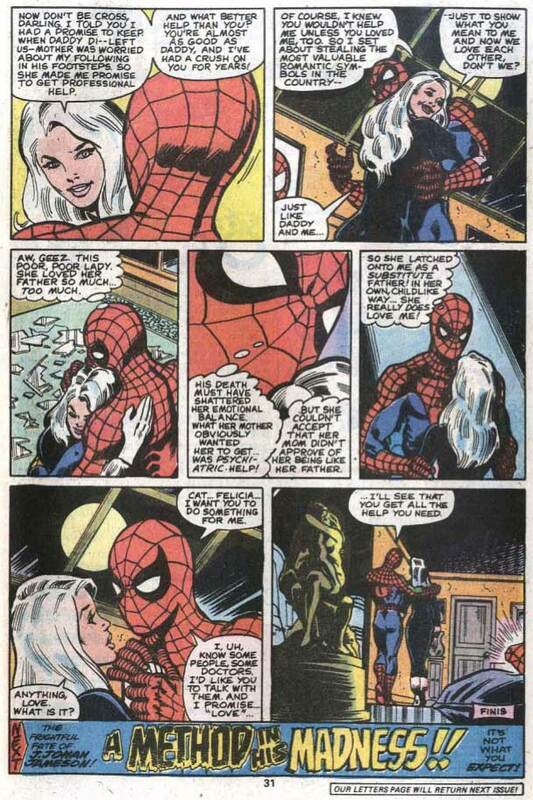 Spider-Man returns to the house to see that Walter Hardy had passed away, and that Black Cat had gotten her wish. 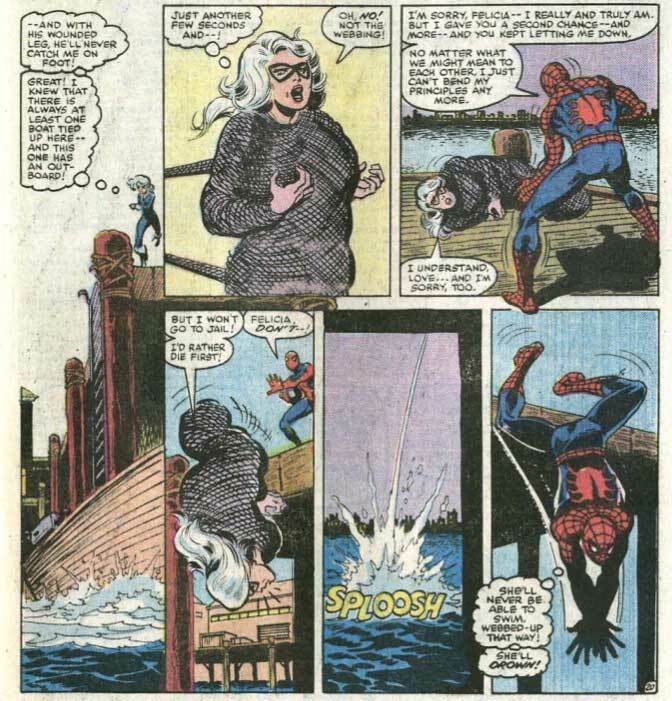 My brain thoughts: Those of us that read comics all know that disappearing into the water means that character will never be back, right? Right?! 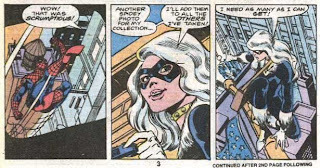 We first learn here that Black Cat is more than your average criminal, as everything she's done was just so that her father could die at home in peace. 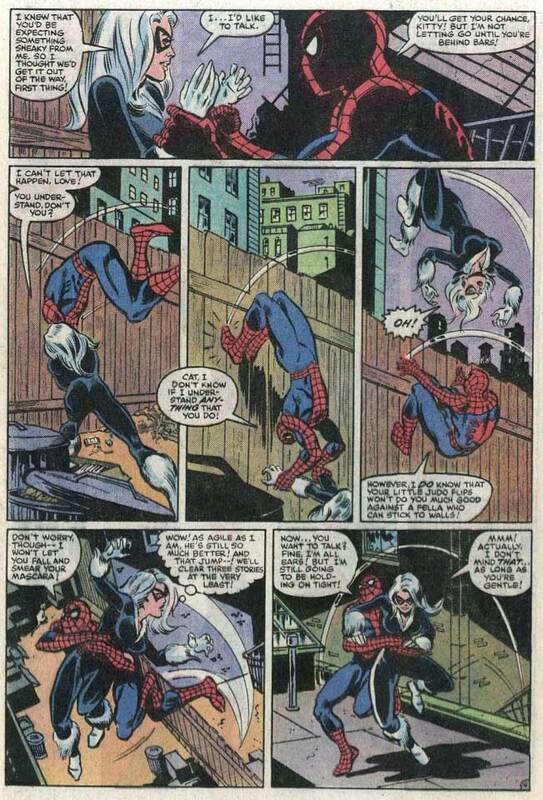 Spider-Man is breaking up a shoot-out in Times Square. Unknown to him, he's getting his picture taken by someone other than himself this time: the Black Cat. She's on her way to steal a valuable statue named The Golden Lovers. 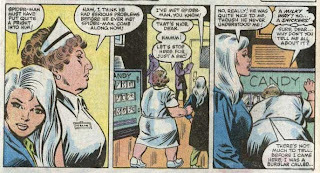 A security guard tries to stop her, but falls prey to some famous bad luck. 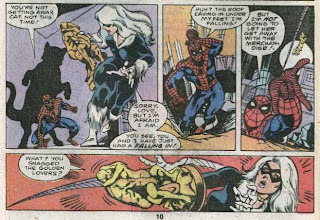 Spider-Man arrives in time for a short tussle, and to prevent her from getting away with the statue. 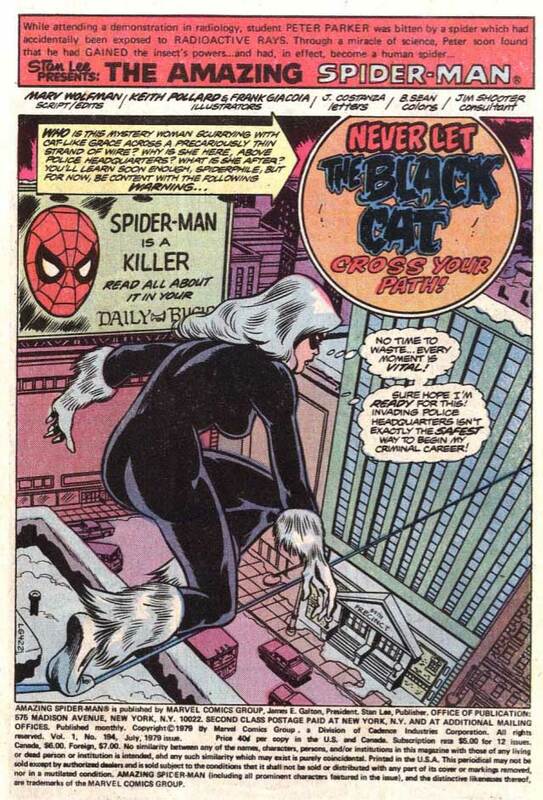 Back at her apartment, we get a glimpse that the Black Cat may not be all that stable a person. 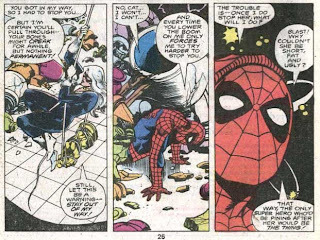 Cat goes after the statue again, and again being met by Spider-Man in the process. Once again, Spider-Man goes at her pretty hard, and once again, he falls victim to being buried under a bunch of crap. "Blast! Why couldn't she be short, fat and ugly?" Hilarious. 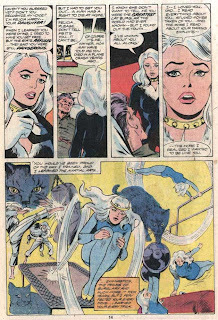 Next, Black Cat makes off with the Rajah Ruby, revealing that the statue and the ruby are only the first two prizes towards her ultimate goal. 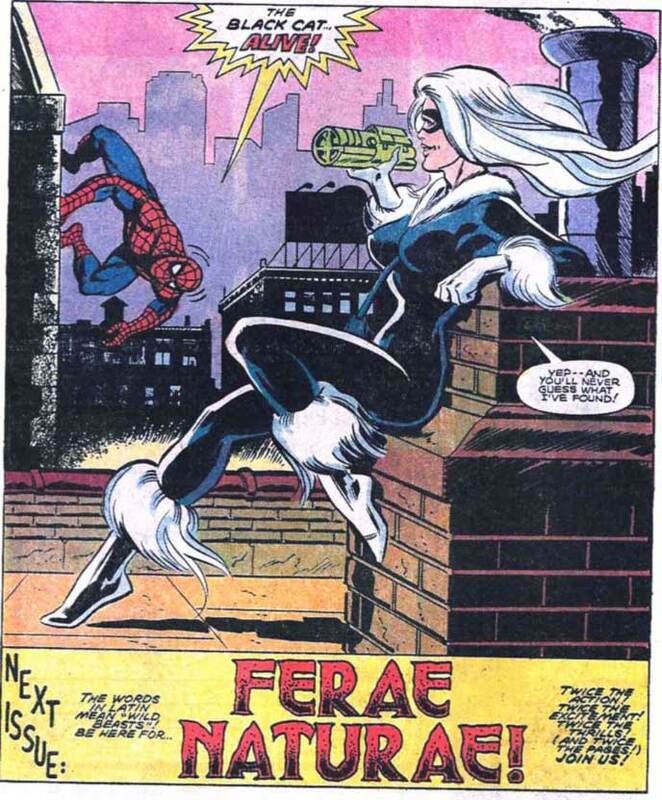 My brain thoughts: After her first appearances, she's played as much more the criminal cat burglar type this time around. No altruistic ulterior motives this time from outside appearances. Spider-Man certainly doesn't pull his punches with the Cat. 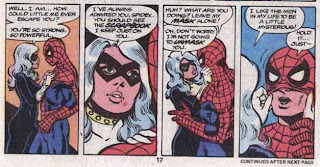 I like the way Black Cat calls Spider-Man "love." 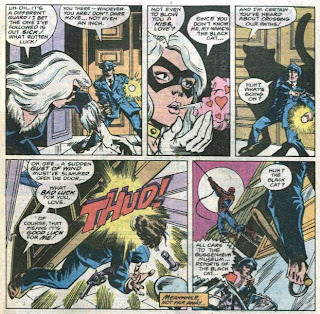 Spider-Man has put together that Black Cat is stealing artifacts associated with love, and catches her in the middle of her latest attempt. She gets away with the loot though, when Spider-Man has to save the guards from being crushed by a steam organ. 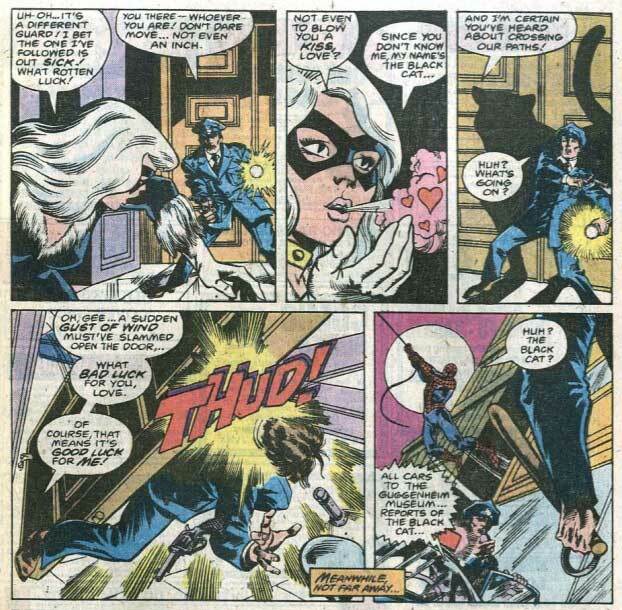 Next we find Felicia Hardy, negotiating to purchase some romantic artifacts from their sleazy owner. He thinks he's about to get extremely lucky, but instead he's about to get extremely robbed. Spider-Man (him again?) busts in and tries to stop her. Again, she makes her escape, with him right behind her. 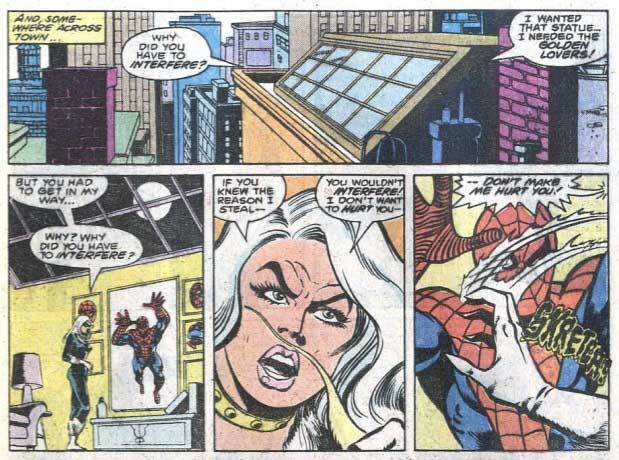 He tracks her via a spider tracer he planted on her to her apartment. He's shocked to learn that she wasn't stealing these artifacts for herself, but that she was stealing them for him. Seems that after the death of her father, Black Cat's crush on Spider-Man turned to obsession, and the issue ends with Spider-Man promising to get her the help she needs. My brain thoughts: Um, okay. This was a revelation out of left field. 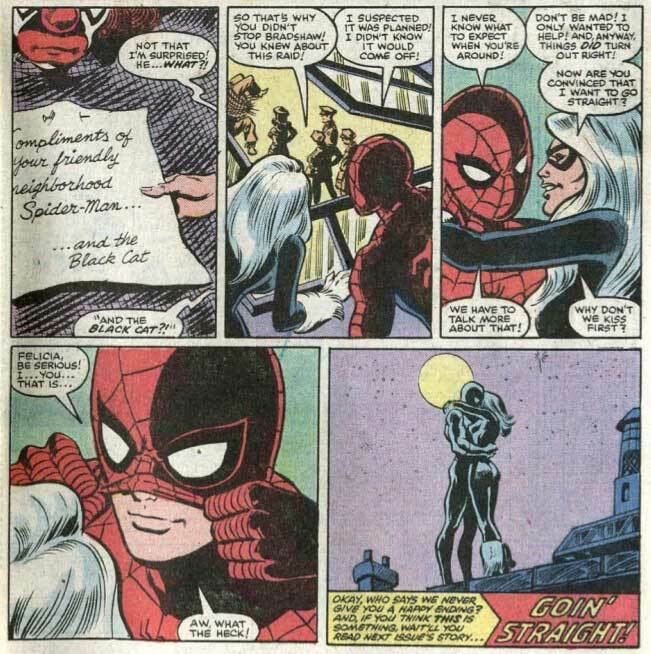 Turns out the exciting and full-of-life Black Cat was really just an unbalanced, love-obsessed, stalker. 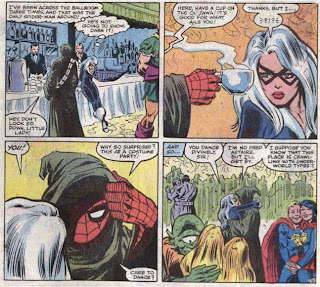 Not the greatest place for the story to go, but it does kind of establish that she does have a sincere attraction to Spider-Man. 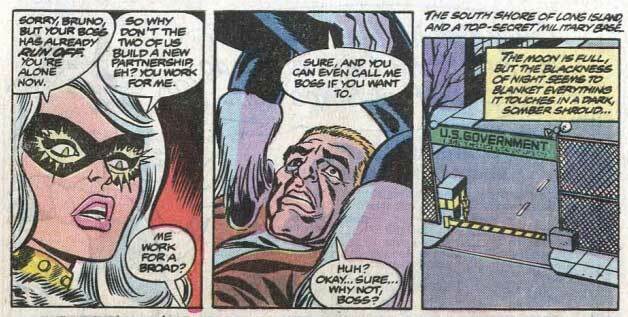 David Michelinie took over for Wolfman on this second part of the two-parter, and I have to wonder if this is what Wolfman had planned from the beginning. 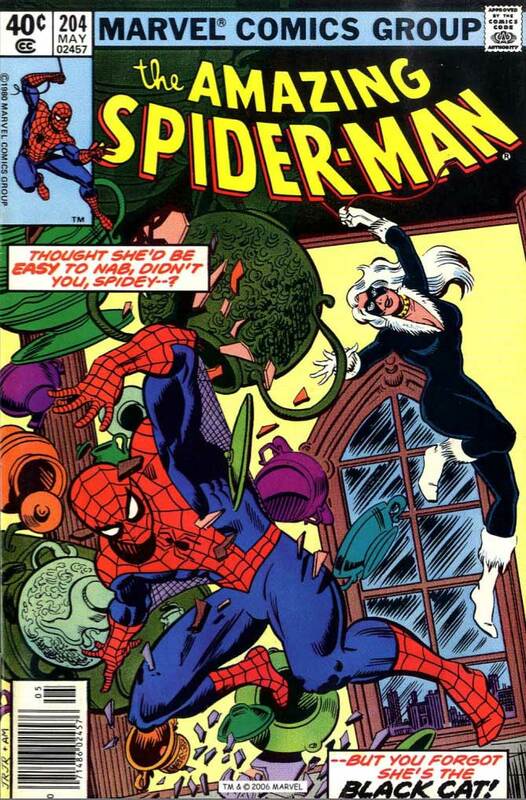 My gut instinct is that this was all Michelinie, because that makes more sense. 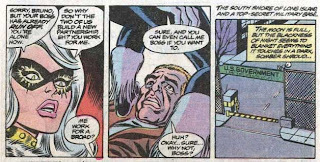 The comic opens on a raving Foolkiller, being dragged off in a straitjacket to the hospital, where he crosses paths with Felicia Hardy. 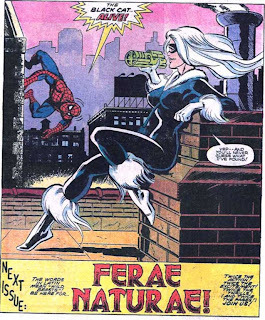 In true Stern fashion, he takes the revelations of the previous appearance and turns them into something better, with Felicia only pretending to be crazy to get out of jail time. The Black Cat makes her escape. Spider-Man is swinging around the city when he gets the news from Captain Jean DeWolff, who looks amazing in her little beret. While Spider-Man tries to sort out his feelings, Black Cat is already back at it, stealing a painting from a swanky penthouse apartment. It comes a little too easy for her this time, so in true thrill-seeking fashion, she ensures the victim knows he had a visitor. 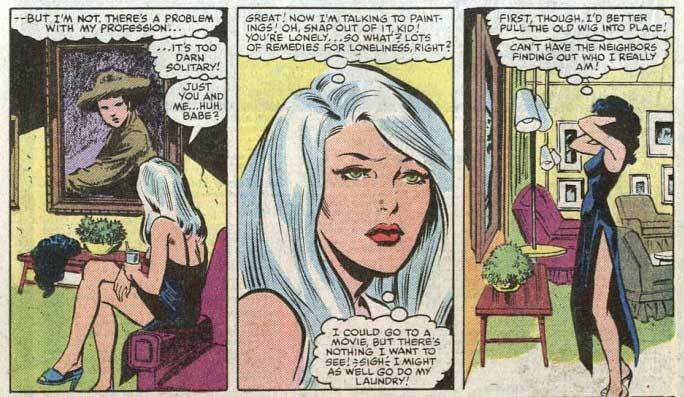 Both Peter Parker and Felicia end up doing their laundry, with Felicia doing it out of boredom and loneliness. There she gets the idea to contact Spider-Man through a skywriting ad, and the next day sees the message, "Spider-Man meet me at our first date" in the sky. 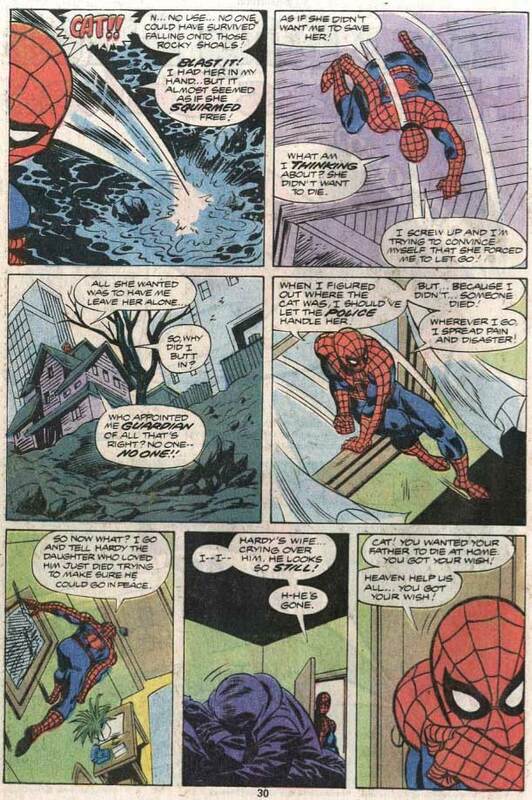 Peter Parker sees the message, and next Spider-Man is arriving at the alley outside Emil Greco's old hideout. 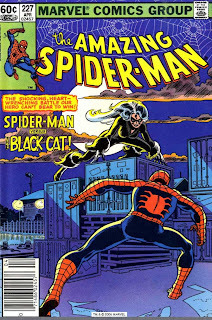 They tussle, with Black Cat enjoying it a little bit more than Spider-Man intended, I think. 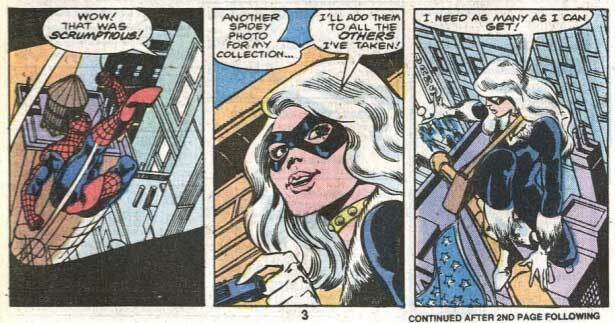 We get a little more depth to Black Cat here, with her saying that she only steals from Maggia individuals. 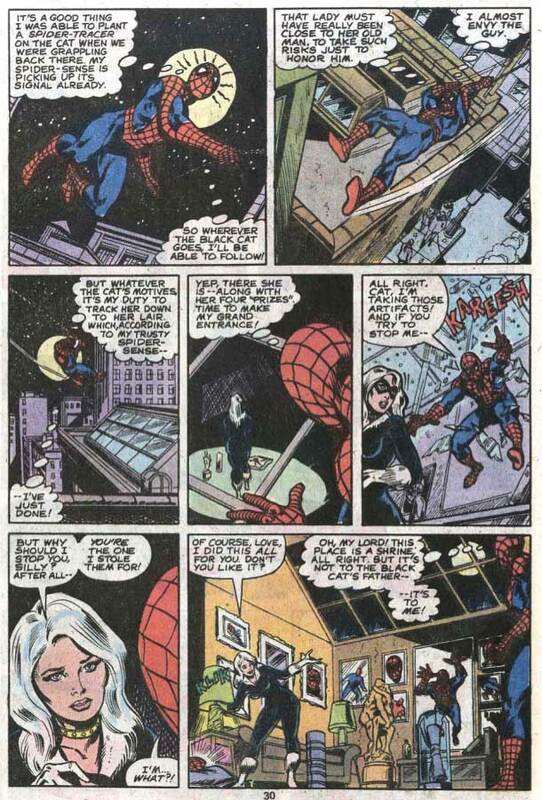 She tries to convince Spider-Man that she'll go straight if he'll let her be his partner. 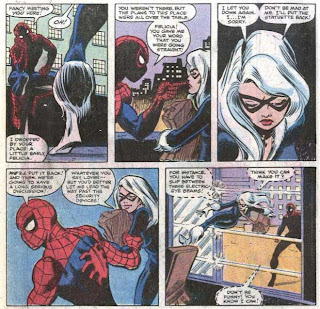 She manages to escape from Spider-Man, but not before leaving a note behind with the stolen painting, as a gesture of good will. 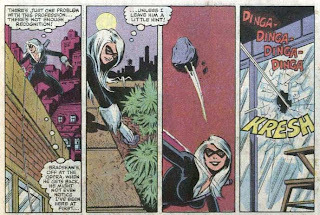 Black Cat does what she does, and brags about stealing the painting directly to the guy she stole it from, all to get a little excitement going. They're able to bust up the party-goers enough for Captain DeWolff and the police to arrive and take them into custody. 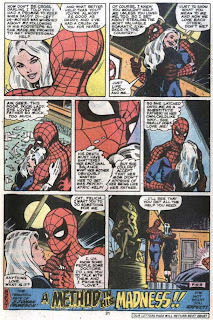 The issue ends with Spider-Man finally giving in to his impulses, as he and the Cat smooch the night away. My brain thoughts: I love Stern. 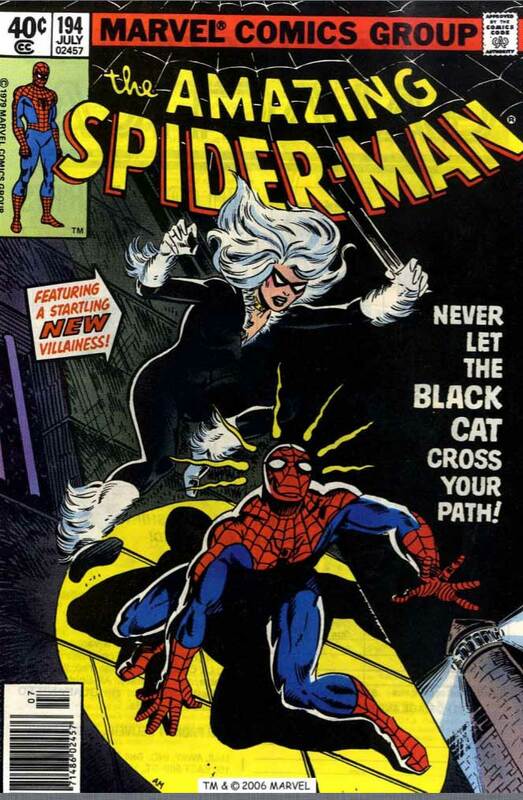 I could just imagine him reading that previous appearance of the Black Cat and saying "well, that's stupid" and then fixing it first chance he got. All in the span of a few panels too (Geoff Johns would take three issues). 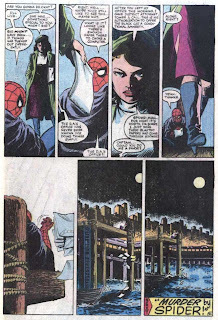 Man, I used to love '80s Romita Jr too. 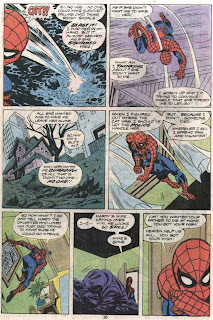 His art with Mooney's inks may have looked more like your standard Spider-Man "house style" (established by his father no less) but it worked for me. 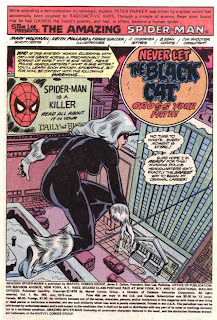 Black Cat gets a further dimension here, as much more of a thrill-seeker than she was in the previous issues. Also, you can see Stern trying to soften her criminal activities up a bit by suggesting that she only steals items that were already stolen. More and more you can see each subsequent writer and each appearance moving to try to put these two together, because they're just so good together. 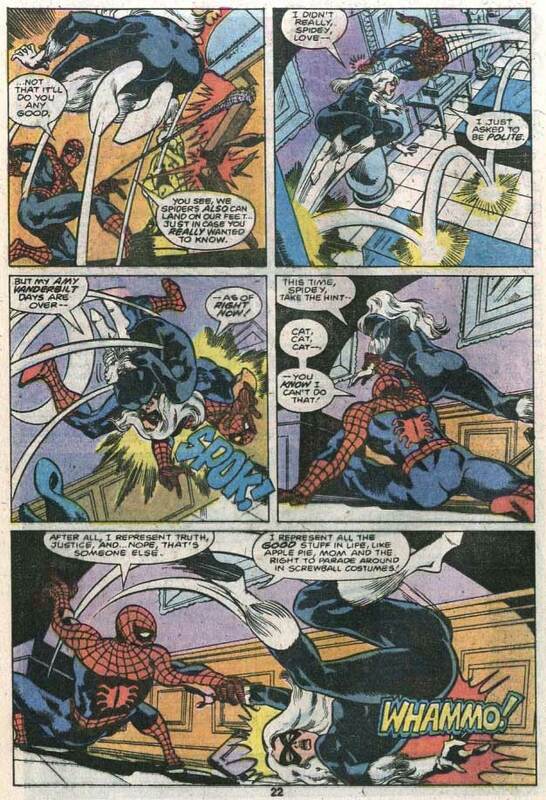 Spider-Man is fighting mad as he makes his way to Captain DeWolff's office. He's upset that her statement to the papers left out the involvement of the Black Cat. 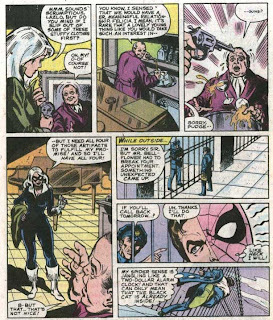 Spider-Man tries to convince her of Cat's efforts to go straight, and DeWolff considers working to get Black Cat amnesty for her past crimes. 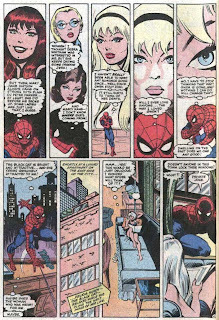 Spider-Man runs down through the usual suspects of his love life (a page I always love anytime it's done; look, there's Gwen), before returning to Black Cat. 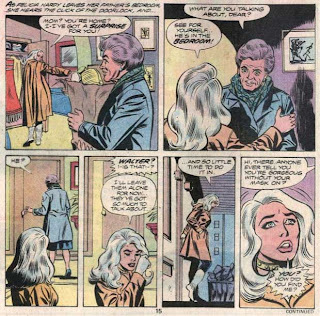 Seems she's already gotten frustrated with her plans to go straight, and is now trying to convince him that they should steal a solid gold statuette together. 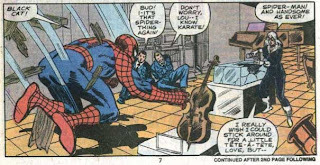 Spider-Man doesn't like this idea. She apologizes, and he heads off for school, leaving her to wonder if love is enough to give up her life of crime. 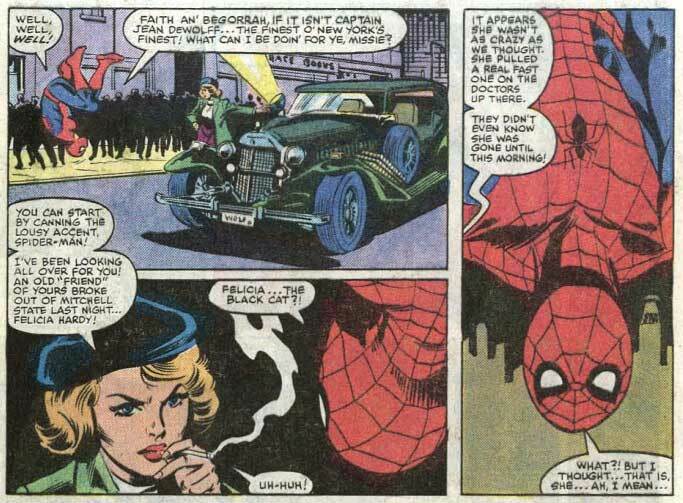 It's not, as the next time we see Black Cat she's stealing the statuette, only to be met by Spider-Man outside. She sets off the alarms on purpose, which brings the Maggia. Turns out if they can't both be heroes, her Plan B is to make them both criminals. 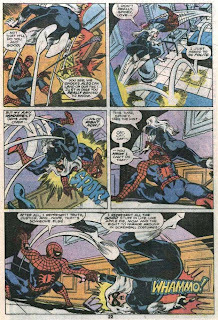 It's not working out well for them, and Spider-Man takes a gunshot to the leg (an image that would burrow its way into my brain and remain there until this very day). They both escape, with Spider-Man chasing Black Cat across the city to the docks. 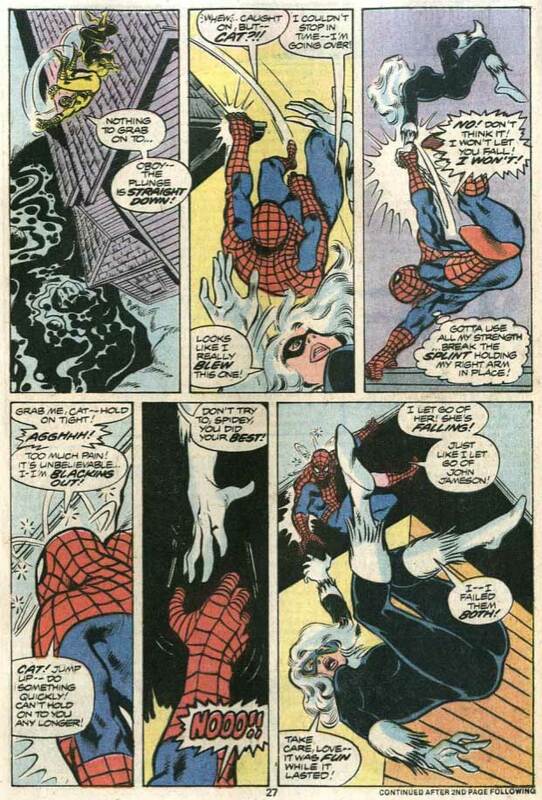 He finally catches her and webs her up, but she rolls into the water. She'd rather kill herself than go to jail. 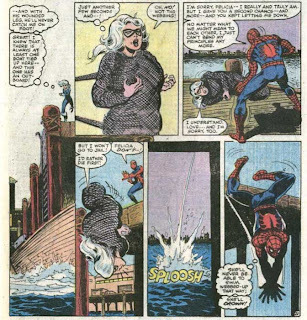 Spider-Man dives in after her, but the search is unsuccessful. Captain DeWolff shows up with Black Cat's conditional amnesty paperwork, further adding insult to injury. 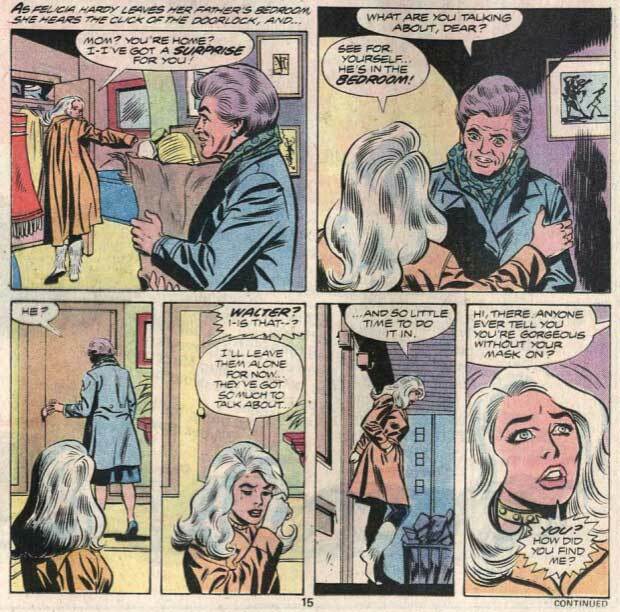 My final brain thoughts: An enjoyable set of comic stories that really establishes Black Cat as a complicated and exciting new character. I have to imagine she was a hit with the fans, as she kept getting "killed" but coming back again and again. 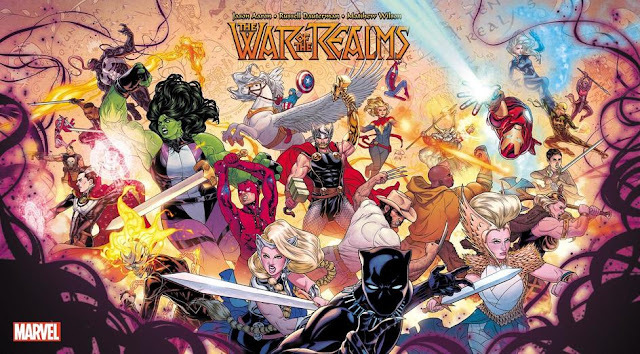 The art in these issues may have been the standard superhero art of the time, but I think it's definitely on the higher end of it in terms of quality. I'm not the biggest fan of Marv Wolfman's time on Amazing (I think he probably could have used a separate editor looking over his stuff), but he did give me one of my all-time favorite characters, so there's that. 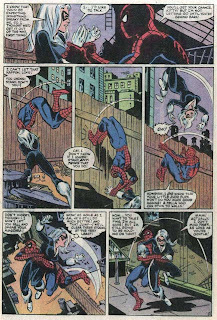 Michelinie tends to be one of those guys you either love or hate on Spider-Man. Roger Stern is one of the unquestioned best of Spidey's writers, and he proves it time and time again. Just buy his stuff and read it already, you don't need my help. So, after all that, a little time goes by, until one fateful splash page at the very end of SPECTACULAR SPIDER-MAN#74. 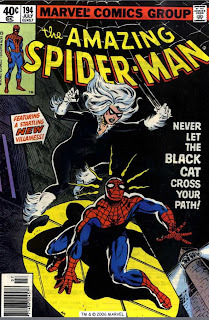 Yes, boys and girls, The Black Cat is back! Which leads us into one of my all-time favorite Spider-Man runs, but we'll cover that next time. Come back, won't you? All three of these stories can be found in the TPB, SPIDER-MAN VS. 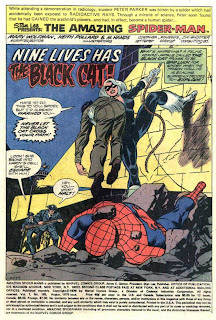 THE BLACK CAT! Spidey is a true ladies man! 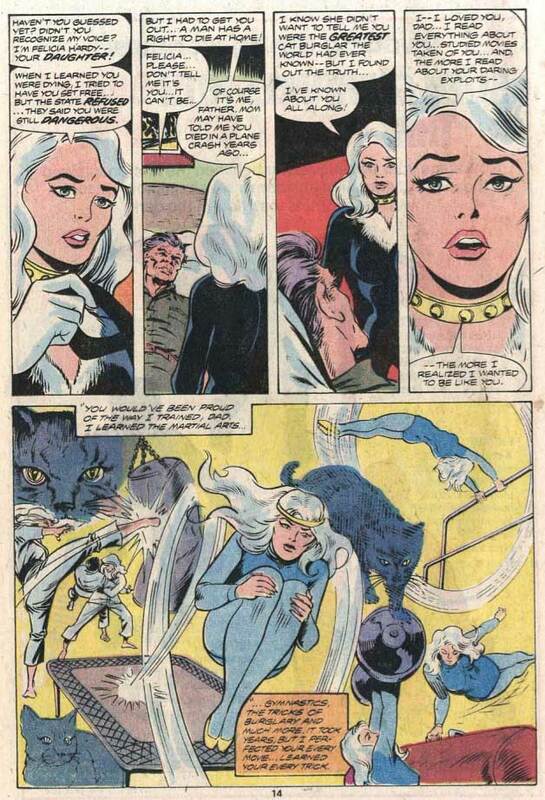 Another notable "admirer" is Silver Sable. 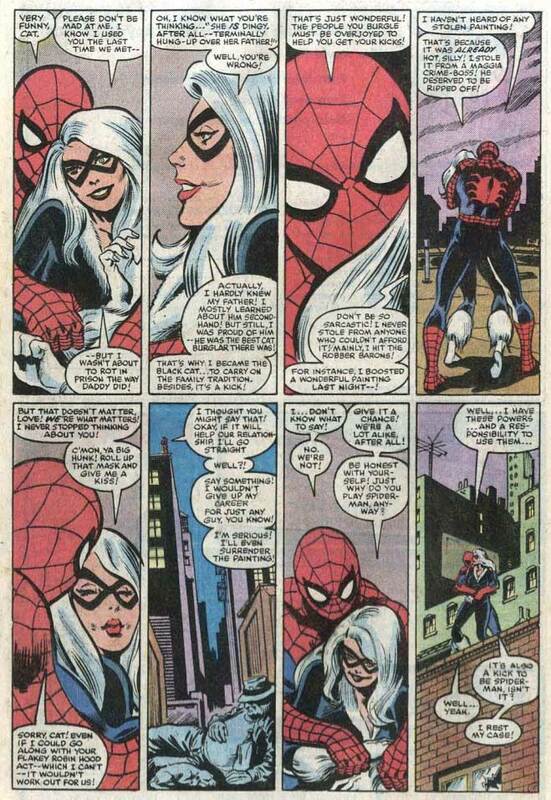 However, though Spidey really had a thing for the Black Cat, she's really into Spider-man but does not like his alter ego's pathetic life. 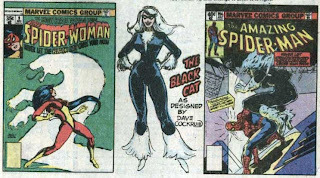 Besides Silver Sable, others admirers for Spider-Man are Ms. Marvel, Spider-Woman, Black Widow, She-Hulk, and Psylocke!! !